If you have employees, you already know two very important things about your business: your success depends on them and they’re also your biggest investment. As such, you should always be on the lookout to ensure you get the most from the money you spend on them. There are a lot of ways to go about doing this, but none are so simple—and thus, so efficient—as using a time clock. Whether you go with something a bit more high-tech like a biometric time clock or opt for the old fashioned model, you have to respect what these tools can do to a simple workforce. With clocks, you know when your employees are showing up, how long they’re working for, when they take breaks and what time they finally leave at night. If you don’t have this information, expect that you’ll be spending money that goes to waste. Now, some people worry that these clocks may have an adverse effect on their employees. The idea is that your people will feel as though they are being micro-managed or that Big Brother is looking over their shoulder. But time and time again, it’s been proven that people appreciate these clocks. It helps them stay focused and, eventually, become better workers. At Allied Time, the bottom line is making more of your company’s most valuable asset. 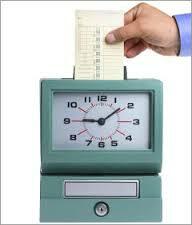 With employee time clocks, you can make sure that every dime you spend on your staff is well worth it.